It is gratifying to see that a leader in New York City recognizes the galvanizing effect that the Saints can have on our community. I will also give Mr. Tagliabue lots of credit for coming here and seeing the great condition of the Metairie facility, rather than taking the word of a local business leader who says that the practice facility was left in horrible condition by the storm and the military. I have noted that some Saints players have expressed concern about the "quality of life" in metro New Orleans and about air and water quality. Given that almost every player lives in unflooded, wealthy suburban areas, and given that the players have had little time to spend here, I wonder where they could be getting the idea that the quality of life here is bad. Could it be people, maybe even highly placed people within the Saints organization, planting those ideas in these millionaire players' head? How are young, very large millionaires made to be afraid? Perhaps by other, much older millionaires? That doesn't sound very World Class to me. Thanks, Mr. Tagliabue, for closing 2005 for us on a high note. We'll make it worth your while. Are We Not Men? Are We Not Women? It is so hard to figure out exactly what went on after Katrina in the city. I was in Baton Rouge with my four children. It is clear some very bad stuff went on, but it is also clear that a lot of rumors got started that made New Orleanians look bad, really bad. Via Slate.com, I found this article in Reason that shows New Orleanians in a much better light than we have been shown in. We weren't all animals. I have been struck over time that I hear many very specific stories about heroism and kindness of a World Class quality. I have not heard nearly as many specific stories about barbarism. The latter stories have been of a more general and hard-to-pin quality: "Did you hear? They were shooting at helicopters!" No names, just "they." Some of the pictures I've seen of the post-crisis Convention Center show chairs in circles and supplies pooled--in other words, evidence of people in miserable conditions trying to band together somehow and ride things out by sharing. As the Reason article points out, local officials were understandably disoriented, tired, and frustrated by the weak state and federal response. Repeating or generating exaggerated rumors was an effective way to highlight the crisis. However, there have been consequences for those rumors. We New Orleanians now need to highlight the World Class qualities of our city and the people who remain and who are returning. A World Class recovery and resurrrection are what we deserve and what we are working on creating at the local level. Negative folks out there are trying to use rumors, past sins, questionable science, and raw fear to undermine a World Class city's work at resurrection. We have to beat them with positive stories and hard work. Read this. It's short and worth your time. World Class extends up the river, too. Bingle: Still, 'old friend.' You've managed kill just about everyone else. But like a poor marksman, you keep missing the target. Bingle (desperate) Dubya, Dubya, you've got Genesis, but you don't have ME! You were going to kill ME, Dubya! You're going to have to come down here! I'm going to post something very postive later today to balance out this, but I just had to get this up right away. Below is a letter published in the Times-Picayune this week. I believe my eyes are telling me that this gentleman is trying to defend the Orleans Levee District. I believe he says something about "a near-perfect" record of flood protection. "Near-perfect" is not good enough, dear sir. This is like talking about "near-perfect" records on stopping space shuttles from blowing up while in flight or "near-perfect" methods of birth control. Not good enough, sir. I am glad that the gentleman highlights the plight of Orleans Levee District workers who lost their homes. Perhaps they will have useful information from the District and the Corps and will be willing to testify in lawsuits against the Levee District and the Corps. As assistant comptroller, Mr. Bollinger himself might have some interesting information about where funds from the Levee District's casino and airport were "invested." Perhaps Mr. Bollinger is glad records were destroyed by floodwaters. Unfortunately, in the past New Orleans has had World Class brazenness in its culture. I'm happy we're now moving on to World Class flood protection. The Times-Picayune has proven itself either a fool or a tool with its misrepresentation of facts about the Orleans Levee District. It is time you publish a bit of real fact rather than out-of-context innuendo. The Orleans Levee District inspects its levees 365 days per year and conducts a drive-by once a year with senior staff from the Army Corps of Engineers, Levee District and Department of Transportation and Development. Why, pray tell, do you focus on the annual, one-day affair -- when it is not relevant to the real inspection effort? Let's be blunt. The Times-Picayune is a tool of the business lobby -- the Chamber and its auxiliary wives -- which is busy collecting signatures and smearing fine people who have devoted a lifetime seeking to protect New Orleans. This group implies that the tragedy of Katrina was caused by corrupt behavior at the Levee District. Someone ought to be sued over this. The Chamber knows that flood walls failed despite everyone doing what they believed were the right things. The Chamber knows that changing state law to require public bidding for professional service contracts will cure the whole state, while destroying the Orleans Levee District won't do much more than enrich the private sector. Many employees of the Orleans Levee District lost everything they had. And they lost their near-perfect record against flooding. Many helped evacuate folks from eastern New Orleans and had to face guns as they evacuated through St. Tammany Parish. I challenge The Times-Picayune to tell the positive about them. Mr. President, reclaim New Orleans. Come down to the Cabildo and sign a new Louisiana Purchase. Buy not the barren land you see before you, but the awesome potential that lies in its regeneration. Raise the American flag over New Orleans once again so that your citizens will know they have a home and will be protected by a great and caring nation. Here beneath this oak, Evangeline waited for her lover, who never came. It is a spot made immortal by Longfellow 's poem, but Evangeline is not the only one who has waited here in disappointment. Where are the schools you have waited for your children to have, which have never come? Where are the roads and highways that you send your money to build, which are now no nearer than before? Where are the institutions to care for the sick and the disabled? Evangeline wept bitter tears in her disappointment, but they lasted only through a single lifetime. Your tears in this country, around this oak, have lasted for generations. Give me the chance at last to dry the tears of those who still weep here. Where is passion and smart leadership? I believe they are coming. The cream will rise. One thing I know for sure about being a fan is this: it is not a vicarious pleasure, despite all appearances to the contrary, and those who say that they would rather do than watch are missing the point. Football is a context where watching becomes doing--not in the aerobic sense, because watching a game, smoking your head off while doing so, drinking after it has finished and eating chips on the way home is unlikely to do you a whole lot of Jane Fonda good, in the way that chuffing up and down a pitch is supposed to. But when there is some kind of triumph, the pleasure does not radiate from the players outwards until it reaches the likes of us at the back of the terraces in a pale and diminished form; our fun is not a watery version of the team's fun, even though they are the ones that get to score the goals and climb the steps at Wembley to meet Princess Diana. The joy we feel on occasions like this is not a celebration of others' good fortune, but a celebration of our own; and when there is a disastrous defeat the sorrow that engulfs us is, in effect, self-pity, and anyone who wishes to understand how football is consumed must realise this above all things. The players are merely our representatives, chosen by the manager rather than elected by us, but our representatives nonetheless, and sometimes if you look hard you can see the little poles that join them together, and the handles at the side that enable us to move them. I am a part of the club, just as the club is a part of me; and I say this fully aware that the club exploits me, disregards my views, and treats me shoddily on occasions, so my feeling of organic connection is not built on a muddle-headed and sentimental understanding of how professional football works. [A championship win] belonged to me every bit as much as it belonged [to the Arsenal players], and I worked as hard for it as they did. The only difference between me and them is that I have put in more hours, more years, more decades than them, and so had a better understanding of the afternoon, a sweeter appreciation of why the sun still shines when I remember it..
We and the Fleur-de-Lis are bigger than any particular self-serving regime of management, coaches, and players. 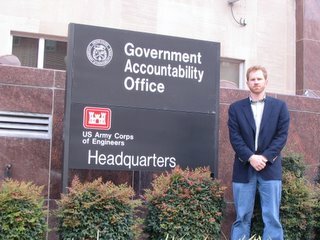 "We [Congress] haven't done the job ... that we should have been doing in terms of our funding of the Army Corps of Engineers in dealing with some of the problems that we have in this country. We have been penny-wise and pound-foolish in terms of our human capital and our physical capital needs of this agency, and quite frankly a bunch of other agencies." At the same hearing, Sen. Susan Collins (R-Maine) apparently said that we (Louisianians, AKA Americans) were failed by every level of government. I am encouraged that a couple of Republicans (a couple of folks with the party that runs everything in DC right now) are saying this kind of thing. Americans, not just Louisianians, should be doing a lot of self-criticism right now. Institutions just aren't working. Leadership positions seem filled with people whose job is to have the job, rather than to get things done. A World Class City like New Orleans deserves leaders who want results that benefit citizens, starting with the worst off and working our way up. Period. 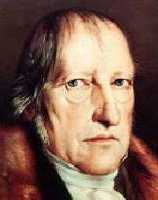 I am enough of a Hegelian to believe that this crisis will force us to find new leaders who want to get the job done. Okay, there's finally some movement and perhaps even a little energy behind the words coming out of the White House. The initial $1.6 billion that President Bush promised weeks ago was dedicated to getting the levee protection "back to pre-Katrina levels." Needless to say, that gave ZERO comfort to anybody here, since pre-Katrina levels got us a tsunami without the earthquake. Now today, President Bush announces an additional $1.5 billion that will get us "true" Category Three protection, the best protection the city has ever had. ("Honest! We promise it'll work this time!" says the Corps.) Bush's Gulf Coast Rebuilding Czar, Donald Powell, said, "The federal government is committed to building the best levee system known in the world." The news is being spun so positively that my friend from California called to talk about the good day we in Louisiana had (and it was good). If that last statement from Powell is true, however, then this request is a good-faith down payment--nothing less, but nothing more either. I'm not an engineer, but everything I've read recently seems to indicate that levees are only part of the full solution to our problem. Outer barriers--a combination of restored natural barrier islands and manmade structures like a gate at the Rigolets entrance to Lake Pontchartrain--are also important. Finally wetlands restoration is CRITICAL, and I haven't heard a word about that out of Washington. As the estimable Oyster puts it, today the feds commited to building the best levee system in the world, or "at least the best Category 3 levee system in the world." It's good, but it's too much to say that it's really comforting. I think we don’t need two years to come up with a plan. All we need to do is bring in some of the experts from the Netherlands, and some from the University of Cal-Berkley and some of our own great people in Louisiana and we could come up with a plan very quickly that would be far greater than category-3. Mr. Powell said that we will have the best levees in the world and if that’s the case, they have to be more than one in every 10,000 years strength. 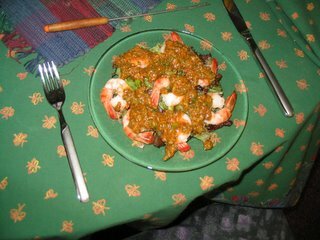 To belabor the food imagery I started with, we need a solid three-course meal. President Bush and his buddy Donald Powell have somehow managed to put together a small but nice appetizer order of shrimp remoulade (that picture above is waaay bigger than the order we got today from Bush's kitchen). That's only going to go so far, and the Lance's saltines on the red-checked tableclothed table are going to get old. We're going to be needing that main course from the kitchen real soon. And according to Chef Van Heerden, the people in Bush's kitchen do in fact know the recipe for the main course. Excellent piece overall, although I don't think it's only New Orleanians who need to learn how better to live in harmony with the wetlands. I think we're reaping what all Americans have sown in one form or another. 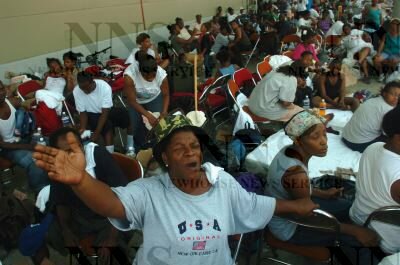 Another decent piece discusses racial considerations in post-Katrina New Orleans. On this front, we can do much better. I don't see people changing their behavior patterns yet. I hear a lot of stereotyping about black Ninth Warders and white Uptowners, and so on. The Citizens for One New Orleans group is a wonderful group fighting to get a single levee board, but they had better get a little darker if they want this truly to be one New Orleans. The Times-Picayune has already stated much the same case, but I am very happy to see the NY Times recognizing that New Orleans is going to die in the current environment. I post here the entire editorial run by the Times on Sunday, December 11, 2005. At this moment the reconstruction is a rudderless ship. There is no effective leadership that we can identify. How many people could even name the president's liaison for the reconstruction effort, Donald Powell? Lawmakers need to understand that for New Orleans the words "pending in Congress" are a death warrant requiring no signature. 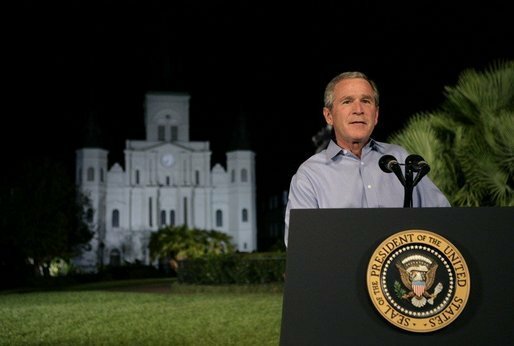 "We'll not just rebuild, we'll build higher and better," President Bush said that night in September. Our feeling, strongly, is that he was right and should keep to his word. We in New York remember well what it was like for the country to rally around our city in a desperate hour. New York survived and has flourished. New Orleans can too. Okay, so the president of Loyola is a smart, hard-working, good dude. "Of course you say that," you might say, "because he thus far has kept you on staff." I would respond,"That is probably a factor in my saying that, but I really think I would say that even if I had been part of the layoffs this week. He's making the best of a very bad situation." Anyway, Loyola President Fr. Kevin Wm. Wildes, S.J., Ph.D., will appear on the WWL TV Channel 4 Morning News Show on December 12 at 6:30 am. He will discuss the university re-opening in January. Fr. Wildes is also scheduled to appear on WLAE's "Road to Recovery" show on Wednesday, December 21 at noon. "6:30 a.m.?????" you might say. "Are you crazy???" Look, as you're coming in from Parasol's or F&M's or the Bon Temps from the night before, just flip on the TV. It'll be on in like 10 minutes. What's it gonna be boy, yes or . . . ? It's time for the President and the Republican leadership to live up to their titles ("chief executive" and "leaders") and say unequivocally that we're going to make this work. We are going to use cutting edge, revolutionary methods to restore and resurrect a world class city and region that has been an incubator, a cultural rainforest, for so much of what makes America great. That needs to happen NOW. Flood barriers, restored wetlands, the whole works. Bush/Republicans: Let me sleep on it. Baby, baby let me sleep on it. Let me sleep on it. I'll give you an answer in the morning. NOLA: I gotta know right now. Bush/Republicans: Let me sleep on it. NOLA: Do you love me? Will you love me forever? Bush/Republicans: Baby, baby let me sleep on it. NOLA: Do you need me? Will you never leave me? Meanwhile, businesses bleed money, insurance companies dither about whether to write policies, and class and racial animosity become possibilities as finger-pointing begins. Leadership can change all of that. Without passionate, courageous leadership, good people turn into finger-pointers. When we're all pointing fingers forward to the promised land, we're not pointing at each other. A better song for us to be living out would be "Baby, It's Cold Outside." We really can't stay (we're at least as Caribbean as we are American), but we really do want to. I'm ready to start a revolution. This is an absolute outrage. Here we are in Month 4 of a terrible, terrible tragedy, and other than hotel rooms and meals-ready-to-eat and some reconstruction, we haven't gotten squat. . . . Has the mood soured? Yes. But are we just going to write off an entire region of the country? Congress ought to get their damned act in order and un-sour it. Was it Oliver Thomas? Hillary Clinton? Ray Nagin? Mary Landrieu? An angry Lakeviewer or Ninth Warder? No, it was Bob Livingston, a usually mild-mannered Republican insider. You remember: just a few years ago he was set to be a few heartbeats from the presidency, until some personal problems precluded his becoming Speaker of the House. I'm encouraged by his candor. If anyone in other parts of the country is reading this, I hope it helps you understand the concern here. If Livingston is saying things like this about his own party, something is terribly wrong. Let's get one voice on the levees, then see about more work on regionalism. "The problem is not St. Bernard Parish, " Hutter said. "We have a model levee board and a model levee system. Ours has been damn good at what they do. They slept at the pump station during the storm. . . . Theirs [Orleans's] was a man-made failure. Ours was a natural disaster." Rep. Hutter has not noticed that St. Bernard's "model levee system" allowed in a storm surge that decimated her parish, an important part of OUR region. Rep. Hutter has not noticed that Katrina did not care about parish lines or that the Army Corps of Engineers' incompetence includes both poorly designed levees in Orleans and the MRGO in St. Bernard. Rep. Hutter likes the politics of "ours" and "theirs." Rep. Hutter is a dinosaur. I am thankful for grassroots groups and politicians who prefer the word "ours" and eschew the word "theirs" when it come to the wonderful region in which we live. I'm in Washington, DC, today for professional reasons. I forgot my hayfork and torch at home, but that won't happen the next time I come up here if NOLA doesn't get what it needs. I'm hoping to get a picture of FEMA headquarters; I think it's fairly easy to find. 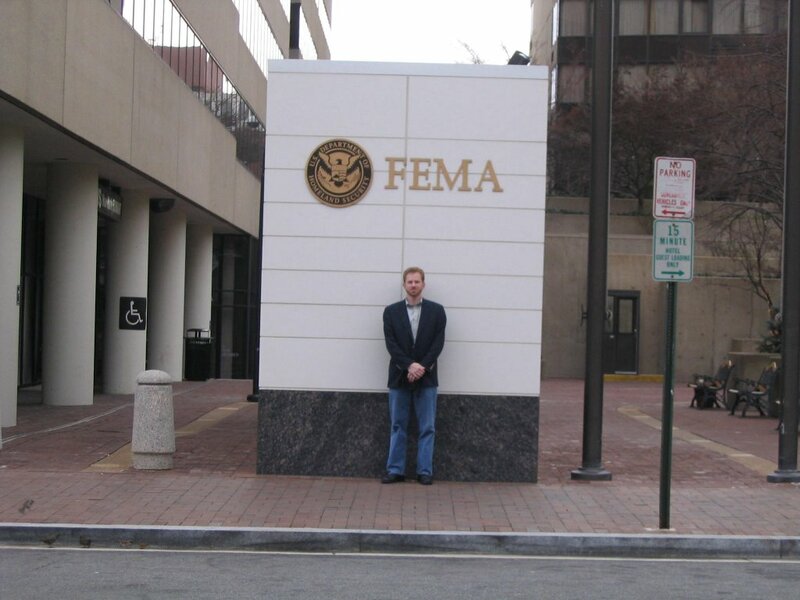 I expect that I'll have an easier time finding FEMA HQ than Mike Brown had finding 20,000 evacuees in the Convention Center. Ba-doom ching! It strikes me how much water is around D.C. And I remember the complaints from D.C.'s early history about how it was being built in a swamp. I like D.C. very much, actually, and I fully hope that the people here (elected and otherwise) work to make that other city founded in a swamp work for a bright future. 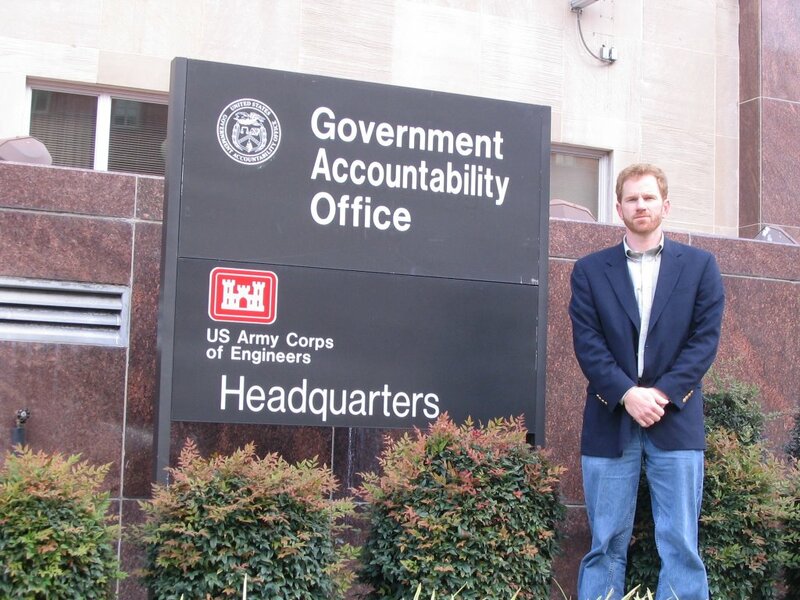 Wonder if the the Corps of Engineers has an HQ? I'll post fun pix if they do.